Those that live in a rural area or on a large property probably do so for the quiet and privacy this entails. Your kids can safely play outside by themselves and your dog has plenty of room to run around. Unfortunately, this can also create a unique type of security concern. When your home sits at the end of a long driveway far away from the road, hearing voices outside or tires on gravel when you don’t expect them is a bit unsettling. While it could simply be someone who accidentally turned into the wrong driveway or a UPS driver, wouldn’t it be good to know exactly when someone crosses a specific point on your driveway? A good driveway alert system is something every homeowner on a large property should have. As soon as someone or something passes by the outside sensor, it sends a wireless signal to the indoor receiver which notifies you with a sound. You’ll never be caught off-guard by an unexpected visitor. The best driveway alarm will be reliable, easy to install, and have a long range. 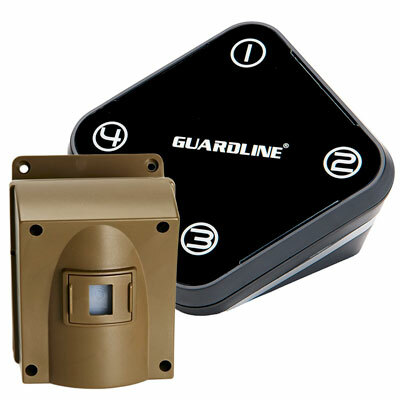 Guardline is one of the most respected names in motion detector alarms. Based out of Seattle, WA, they manufacture, test, and support all their products in-house. 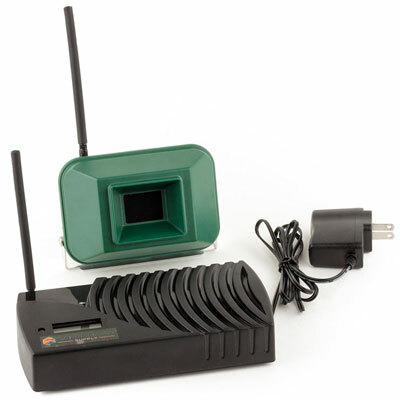 Their base model GL-2000 driveway alert system has been a top-seller since introduced and is considered by many to be the best wireless driveway alarm out there. The system includes a passive infrared sensor (PIR sensor) which detects movement from cars, people, and large animals up to 40 feet away from the sensor. The completely weatherproof sensor is designed to work in temperatures of -4 to 140 degrees F so it’s work wherever you live. When movement by the sensor is detected, it transmits a signal up to 500 feet away (a 1/4 mile version is also available if you need a longer range, or have hilly terrain or lots of foliage) to the compact receiver which you can place in your kitchen, home office, garage, workshop, or even backyard (it can run on AAA batteries when not plugged in via AC adaptor). 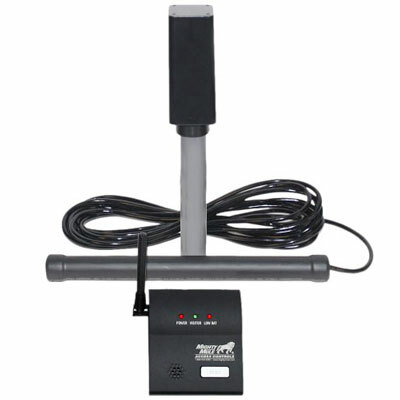 Unlike other driveway monitors, you can select from 30 different chimes to find one you (or your dog) like. If you have a shop or garage full of expensive power tools (ie: cordless drill, rotary hammer, plasma cutter, etc.) and want an alternative to a complicated and expensive home security system, the Guardline (or any driveway alarm) can be a good option to notify you when someone is approaching your property. You still want to take steps to keep your garage secure but knowing someone is on your property makes a big difference. The Guardline system is fully expandable up to 16 sensors and unlimited receivers. A receiver can cover up to 4 zones and up to 4 sensors per zone so complete coverage of your property is possible. You may not think about needing additional sensors now, but it’s good to know you’re covered down the road. Installation is super easy. Just mount the sensor to a tree, post, stake, or other object where you want to detect movement. 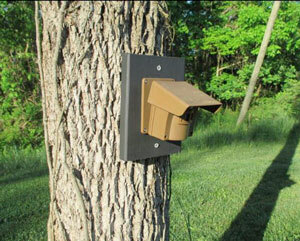 While false alarms (ie: squirrels and cats) are rare, some users mount the sensor a 2-3 feet above ground just to be sure. Keep in mind that while the base system is capable of transmitting up 500 feet away, this is under ideal conditions. If your property has not-so-flat terrain or lots of trees between sensor and receiver, you’d be better off going with the extended range 1/4-mile model. It’s also worth mentioning that the sensor emits a tiny red LED light when it detects something. So, if you don’t want to risk anyone knowing they’re being detected, simply use a small square of electrical tape to cover the light. The biggest negative that consumers report is the housing for the sensor isn’t the best quality (thin material, ball joint for aiming is a bit loose). This won’t affect performance but something the company might want to look at improving in the future. While you may still get some false-alarms every now and then with the Guardline, we’ve found it to be a bit more reliable than other models. Another “made in the USA” product, the Driveway Informer wireless security alert system has 50 ft detection range and up to 1,000 ft transmission range. Like the Guardline, it uses a PIR sensor to detect heat movement from cars, people, and animals. What we really like about the Driveway Informer is the sensor build quality. The heavy duty ABS mold will hold up to the elements well and the green exterior allows it blend in with the surrounding landscape. While having an external antenna makes it less sleek than others, it does seem to help with achieving the stated wireless range. The receiver has a unique LCD counter on the front to allow you to track how many things the sensor detects over time. Great if you want to know if anybody’s been on your property while you were away from home. There is a volume control on the back of the receiver but no options for different chimes. This particular driveway motion sensor alarm might be a bit short on features but plain flat-out works. Most users seem to agree the maximum range is fairly accurate and the driveway senor detects things when it’s supposed to. We do wish the receiver had a few more options as far as alert sounds were concerned. Also, replacing the 2 AA batteries on the sensor isn’t the most convenient as you have to take off the entire back of the housing but this is probably to help with weatherproofing. 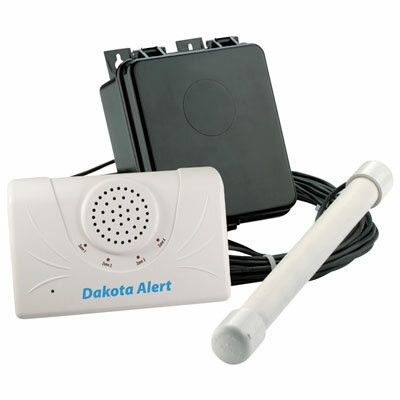 If you’re only concerned with detecting vehicles on your property, which all but eliminates the false alarms associated with infrared sensor systems, the Dakota Alert kit is as good as it gets. Utilizing a metal probe that you bury into the ground, it only alerts you when metal (cars, trucks, ATVs, lawnmowers, etc.) pass in front of it. The DCPA-2500 is the best long range driveway alarm on the market with a transmission range of up to 2,640 feet (1/2 mile). Installation is simple. You bury a small PVC pipe with a magnetic probe inside parallel to your driveway. At one end of the probe is a 50 ft wire which connects to a small transmitter box that gets attached to a nearby tree or post. This box then transmits the signal up to a half mile away to the wireless receiver. The receiver itself is no frills but excellent. It has multiple tones and volume which can be set loud enough to be heard in almost any size home. Each receiver can cover up to 4 zones when you purchase additional probes/transmitters. The great thing is that each zone can be set to a different tone so you can easily tell which area of your property a vehicle is detected on. Some may have issues with getting the Dakota Alert (or any other magnetic driveway alarm for that matter) to work properly. This is usually due to having metal interference nearby from steel rebar in some concrete driveways, utility cables, or other metal nearby. For them, a system using an infrared sensor would be a better option. While the Dakota Alert is great, it’s not the cheapest. There isn’t a good reliable alternative if you have a very long driveway but if it’s on the shorter end (as far as large properties are concerned) like 200-400 ft, you may also want to consider the Mighty Mule below. For a good economical option to detect vehicles on your property, the Mighty Mule driveway alarm fits the bill. Utilizing a magnetic sensor, the same way as the Dakota Alert, it can detect vehicles or other large pieces of metal moving within 12 feet of the probe/wand. The biggest difference is that the range the transmitter communicates with the indoor receiver is only up to 400 ft. For many homeowners and businesses, this is plenty of range and probably why it’s such a popular system. We like to think of the Mighty Mule as a good driveway doorbell. There are some downsides. First off, the wire that goes from the probe to the transmitter is only about 6 feet (compared to 50 ft with the Dakota Alert). Fortunately, the transmitter comes attached to a short post which mounts directly into the ground (instead of on a tree). In addition, the adjustable volume on the receiver just doesn’t go very high. You probably won’t be able to hear an alert throughout the house. Finally, there seems to be a slight delay when the driveway sensor detects a car and when the alert on the receiver sounds. Not a big deal but slightly annoying. If you want a system where you never have to worry about replacing batteries or wiring during installation, the HTZSAFE solar driveway alarm is worth considering. Included in the kit are two solar sensors which you mount on opposite sides of your driveway (or anywhere else up to 190 feet apart). When something or someone passes between the sensors (similar to a garage door sensor), a signal is sent wirelessly to the indoor receiver up to 1/4 mile away. Each solar sensor contains a lithium ion battery that is recharged during the day (even when cloudy or rainy). It’s not intended for indoor use as the batteries can only support 3-5 days without natural light. The solar sensors are completely water proof and will work in any climate. Up to 32 sensors can connect to a single receiver so even Jackie Chan would have a hard time making it across your property without being detected. As opposed to using a single passive infrared sensor, these use multiple active infrared sensors to cut down on false alarms (the object has to trip both infrared beams at the same time). That said, it’s a good idea to mount these a bit off the ground so you’re not alerted every time a bird walks in between the sensors. Optimally, you’ll have a post on each side of the driveway you can attach them to. 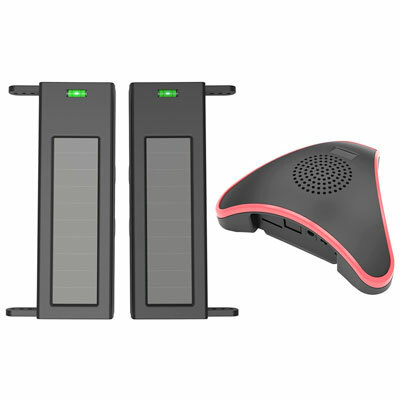 Solar driveway alarms systems are still fairly new but HTZSAFE makes a good option here. Good range and simple “set and forget” install. It would be nice if the receiver had more than 4 ring tone options but at least they’re all decent. All of the models listed above use one of the following types of sensors to detect something passing by. This is the most common type of driveway sensor. A passive infrared sensor detects objects that radiate heat energy, such as people, animals, or car engines. When the heat pattern changes, a signal is transmitted to the indoor receiver to create the alert. This is a single wholly enclosed sensor. The Guardline and Driveway Informer models use a PIR sensor. This sensor consists of two parts. The transmitter sends out a beam of infrared light and the receiver picks up the beam. When an object crosses the beam’s path and the beam is interrupted, it sends a signal to the indoor receiver which creates the alert. The HTZSAFE model above uses an AIR sensor. See additional passive IR and active IR differences here. Simply put, a magnetic probe sensor detects a mass of metal. The sensor is usually enclosed in a short PVC pipe which is buried a few inches underground next to the driveway. When a metal object (such as a car) crosses it vicinity, a signal is sent from the nearby transmitter to the indoor receiver. This is the most reliable type of sensor when you simply want to know if a vehicle is on your driveway. False alarms from animals are nonexistent.